More than 450 professional attendees earned 4,797 CME credits by participating in the STSA 62nd Annual Meeting November 4-7, 2016 in Lake Buena Vista, FL. STSA attendees can provide feedback about the long-term impact of the 62nd Annual Meeting on their practice by completing a 6-month follow-up survey. The STSA 62nd Annual Meeting was held approximately six months ago from November 4-7, 2015 in Lake Buena Vista, FL. By all accounts the STSA 62nd Annual Meeting was a huge success. The educational program featured more than 20 hours of ACCME-accredited content, and STSA awarded 4,797 CME credits (or the equivalent) to professional meeting attendees for their participation. 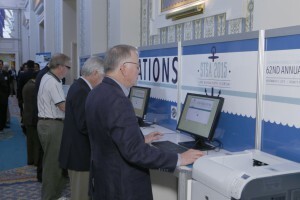 2015 total meeting registration set an all-time record high for STSA. 636 individuals registered for meeting compared to an average of 530 registrants for the previous five Annual Meetings. Industry participation was equally as impressive: 40 companies were represented in the Exhibit Hall, and six companies awarded STSA educational grant funding to assist in covering meeting-related costs. Select STSA 2015 video presentations – including invited talks by Tirone David, MD and Robert Bartlett, MD – are available on CTSNet. Visit www.stsa.org/62ndannual to learn more about the meeting and review the full educational program. If you joined STSA at the 62nd Annual Meeting, we want to hear from you. STSA is seeking feedback from 2015 Annual Meeting professional attendees to help determine the long-term impact of the educational program. All meeting registrants received an e-mail this morning including a link to the STSA 2015 Annual Meeting 6-month Follow-up Survey. If you attended the November 2015 STSA Annual Meeting but did not receive an e-mail inviting you to participate in the 6-month follow-up survey, please contact STSA and stsa@stsa.org or (312) 202-5892 for assistance. The deadline to complete the survey is May 4, 2016. The purpose of the STSA 62nd Annual Meeting six-month follow-up survey is to measure the level to which CME content improved attendees’ long-term competence, performance, and/or patient outcomes in clinical practice. STSA also seeks to identify any barriers that have prevented attendees from implementing intended practice changes and improvements. Topic suggestions and feedback about current areas of need and professional practice gaps will be considered by the Postgraduate and Program Committees as they work to create the 63rd Annual Meeting November 9-12, 2016 in Naples, FL. Save the date for STSA 2016: November 9-12 in Naples. The STSA 63rd Annual Meeting is shaping up to be another excellent event. STSA President, Dr. A.J. Carpenter, recently conducted a planning visit at the Naples Grande Beach Resort. The Postgraduate Committee is hard at work identifying 2016 invited talks and topics. The Program Committee is currently reviewing more than 260 abstract submissions in anticipation of their May 6 Program Planning Meeting in Chicago. Learn more at www.stsa.org/63rdannual.